FINLAND: The Finnish government has selected Suomen Hyötytuuli Oy to build the country's first offshore project. The employment and economy ministry has also promised a EUR 20 million grant to support the construction of the 40-44MW Pori Tahkoluoto project in the Baltic Sea. The proposal suggests a project made up of 10 or 11 turbines, implying a 4MW model. A turbine supplier has not been selected. Suomen claims the project could be operating as soon as the end of 2016. The turbines would be between 0.6 and 2.5 kilometres from shore, near the west coast city of Pori. In addition to the grant, the government said that the project may be eligible for subsidies over a period of 12 years. Economic affairs minister Jan Vapaavuori said he hoped the project would "serve as a trailblazer for Finnish offshore wind power". He added the development of a demonstrator was necessary to test foundations in the Finnish seabed and the icy conditions prevalent in that part of the Baltic Sea. The grant is conditional on Suomen agreeing to share information with other developers on construction, performance and maintenance of the project. The ministry said that eight other companies put forward proposals to build a demonstration project. Suomen has already installed one stand-alone offshore turbine in Finnish waters. 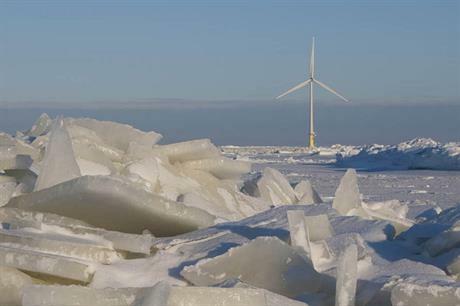 The Siemens 2.3MW turbine has been operating eight kilometres from shore near Pori since 2010.